The design of the Tangier Headboard was inspired by architecture of the Mediterranean region. Named for the exotic Moroccan city, it evokes a sense of mystery and magic. The history of Tangier is very rich, due to the historical presence of many civilizations and cultures, starting before the 5th century BC. Between the period of being a strategic Berber town and then a Phoenician trading center, Tangier became a nexus of many cultures. The city’s name is said to come from Tingis, the daughter of Atlas, the mythical supporter of the Heavens. Tangier was founded in the early 5th century BC by Carthaginian colonists, who were probably the first ones to settle around the coast. The Greeks ascribed the city’s establishment to the giant Antaios. The town of Tingi came under Roman rule during the 2nd century, and then, under Augustus, became a colony. In the 5th century, Vandals conquered and occupied Tingi and from there swept across the Maghreb. A century later Tangier fell to the Byzantine Empire, before coming under the control of the Umayyad Caliphate in 702. With this historical backdrop, the Tangier Headbaord was designed by Shah Gilani, ASFD. It is available in king and queen sizes, and offered in a variety of finishes and accents. This headboard can also be made as a complete bed, by special order, with foot board and side rails. Upholstery is in COM. 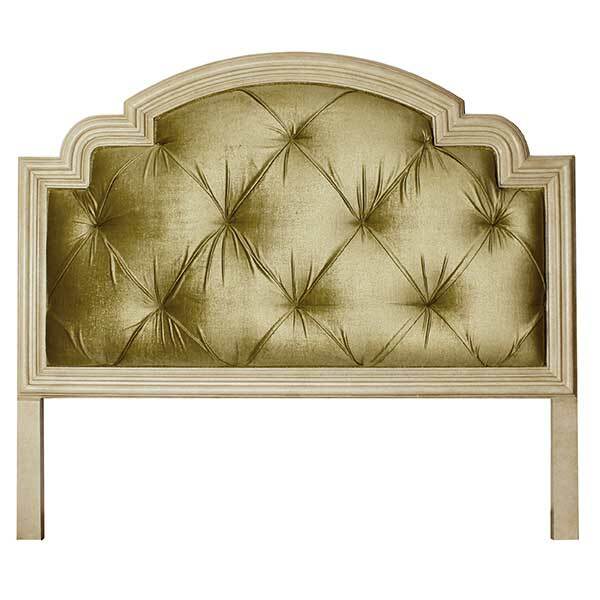 With its exotic elegance, it makes an exceptional headboard for upscale residential and hospitality interiors. Custom sizing is available.